John K. Roth is the Suzanne R. and Dr. Lawrence M. Fishman Scholar in Residence for FIU’s Holocaust Studies Initiative. Holocaust scholar John K. Roth has reflected on the power of trust in the face of war and genocide throughout his career. Recently named the Suzanne R. and Dr. Lawrence M. Fishman Scholar in Residence for FIU’s Holocaust Studies Initiative, Roth spoke with FIU News about the importance of maintaining trust, particularly in times that challenge our belief in what is good in the world. One of your upcoming lectures is on “Losing Trust in the World.” With the atrocities that still occur today, how can individuals maintain their trust in what is good? Murder and torture, tyranny and terror, along with lying, greed, theft, corruption and countless other human shortcomings and follies—these things, we often realize too late, destroy trust by robbing us of what is good and by stealing life itself. That awareness and conviction can and must lead us to try our best to restore trust as best we can: through protest, resistance and attempting to heal hurt, relieve suffering, and save lives in all the ways, times and places we can, for as long as we can. Only with such determination can we help one another to sustain and grow trust in what is good. What lessons from the Holocaust do you believe are most relevant today? Never give up struggling for justice. That means resisting racism and antisemitism, to name just two of the conditions that made the Holocaust happen. Our protest and resistance do not guarantee that injustice, including genocidal disasters, will disappear, but we fail to struggle for justice at our peril. What is the most important message you want your students to know and understand about the Holocaust? I want students to understand that the Holocaust did not have to happen. The same is true of every mass atrocity crime. Then, I want students to think about what could have prevented the Holocaust from happening. Those issues require immersion in historical study. Getting the history right, to the best of our ability, is immensely important. As we do that work, it can and should under-gird reflection that leads to reflection—and action—about responsibilities we have presently and how we are accountable for what takes place in our own lives and circumstances. You have received many accolades as a Holocaust scholar. What is your proudest accomplishment in the field? When I began to teach about the Holocaust in the early 1970s, attention to the topic was just starting to grow. One of my most meaningful accomplishments has been to contribute to that process and to help establish, in particular, a commitment to Holocaust-related teaching and scholarship at Claremont McKenna College, where I taught for more than 40 years. It is especially meaningful to me to see how students can be positively impacted and changed by good teaching and study about the Holocaust. My writings about the Holocaust, I believe, have helped to foster understanding about the implications and reverberations of that catastrophe, especially with regard to religion, philosophy and ethics. Some of my work has also helped to advance attention to the experiences of women during the Shoah. What do you hope to accomplish during your time at FIU? I look forward to learning while I am at FIU. I hope to find out especially how students respond to the Holocaust and other mass atrocity crimes. I want to find out not only what questions and concerns history raises for them but also what hopes, passions and needs move them most profoundly in the troubled post-Holocaust world that is ours in 2018. John K. Roth is the Edward J. Sexton Professor Emeritus of Philosophy and founding director of the Center for the Study of the Holocaust, Genocide and Human Rights (now the Mgrublian Center for Human Rights) at Claremont McKenna College. 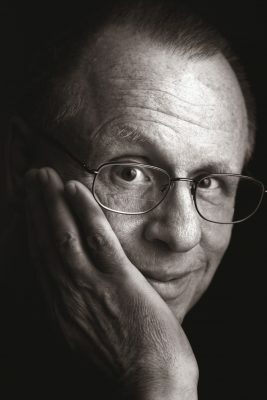 Named the 1988 U.S. National Professor of the Year by the Council for Advancement and Support of Education and the Carnegie Foundation for the Advancement of Teaching, Roth has also received the Holocaust Educational Foundation’s Distinguished Achievement Award for Holocaust Studies and Research. Roth’s lecture on “Losing Trust in the World” is at 2 p.m. on Tuesday, Feb. 13, in SIPA 125. He will also speak on Ethics During and After the Holocaust at 2 p.m. on Sunday, Feb. 11, at the Jewish Museum of Florida-FIU, 301 Washington Ave., Miami Beach. Both events are sponsored by the Holocaust Studies Initiative, part of the Global Jewish Studies Program at the Steven J. Green School of International and Public Affairs.